The Witches’ Tanabata isn’t easy-going. Very soon, it will be Tanabata. A familiar event, marked by the hanging of pieces of paper, with wishes written on them, on bamboo branches. Ushiromiya Maria was supposed to write one of these at school. There was plenty of paper, so students were allowed to use several pieces, if they could think of enough wishes. At first, everyone was excited about writing a lot of them, but after writing 2 or 3, despite their youth, they realized to their surprise that they could only write trivial things, such as ‘I want to be rich’ or ‘I want to become *blank*’. However, unlike the other children, Maria thought that writing one wish was enough. Rosa was busy with work, and had to spend the night there often. In the manner of a young child, Maria understood that was just part of her mother’s job, but that didn’t mean she wasn’t lonely. So she wrote down her simple wish about her mother coming home every day. By the way, have you ever thought about who grants the wishes written on these pieces of paper…? There are a lot of theories, such as the Tanabata legend, or the countless ancient gods of Japan……, but in fact, all are wrong. What grants the wish is that which is closest to the person who wrote it. It can be the so-called guardian spirits or ancestors of the person. For those without a spiritual guardian such as that, it can be their parents or a close friend. And to Maria, the witch was even closer to her than her own mother. So, in Maria’s dreams on the night of Tanabata, Beato accepted the wish that the girl had entrusted to that piece of paper, and read it. Beato crossed her arms and started mumbling. It looked as though she was mulling over how best to refuse and not grant the wish. Rosa was the president of a small company. Things hadn’t gone as planned yet, and every day was a precarious financial situation. She was desperately trying to expand her business by clinging on to any order she could get, and using that to bring in more requests little by little. If Rosa were to come home at a set time every day in this state, it would not end well. In order for Rosa’s company to achieve financial security overnight, she would have to make a wish herself, and make it clear exactly how and where the magic should be used. But even if the magic from Maria’s wish might reach Rosa, it would not extend to Rosa’s company. In short, the wish would be granted by Rosa suddenly losing her job, or else with the company being suddenly crushed, so that Rosa could be at home every day. That probably wasn’t the wish Maria was hoping for. ……Because of this, Beato had come into Maria’s dreams to ask what her true wish was. The desire for her Mama to come home was only the beginning of Maria’s true wish. The wish she truly desired was something that must not remain abstract. Normally, if the ones granting the wish were mischievous, they would grant it no matter how abstract it was. 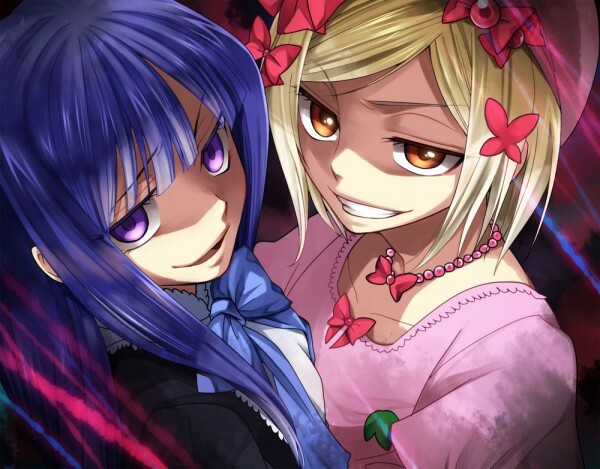 But Beato was Maria’s close friend, so she didn’t play that kind of trick. …Because she knew that Maria’s true wish was something more. She didn’t just want her mother to come home every day. It was something wonderful even just to imagine. A meal that the two made together, and could enjoy together while chatting. Maria had never once asked to eat out. ……Just eating at the table with her mother was more than enough. Even though it only happened rarely, ……Maria wished for it to happen every day. The glimpse of that dream world made Beato laugh warmly. Maria wished for her to somehow grant that wish, but Beato simply giggled and spoke again. “I do believe that this dream of yours includes more than just a happy dinner. ……That wish still needs more to it before I can listen to it. What you truly wish for surely continues much further, after having that fun meal. Of course. ……A fun meal between mother and daughter was only the beginning of a fun family lifestyle. I’ll make tea for Mama. As we drink our delicious tea together, we’ll watch TV. Then I’ll heat up the bath, and we’ll take a bath together. I’ll even put in one of those bubble-filled bath bombs that Mama loves. Then we’ll splash around having fun in the tub, and make even more bubbles. Then she’ll kiss me goodnight, get things ready for tomorrow, and go to sleep. ……Then, the sun will rise, I’ll wake up early, and wake Mama up when she oversleeps. Good morning, Sakutaro. Yeah, I know. I’ll bring Mama something to drink. I’ll bring her some chilled original blend vegetable juice in a chilled cup. If she drinks it right after waking up, she’ll feel refreshed and smile. I’ll put bread in the toaster and cover it with rose-flavored jam. Then I’ll wait for the morning paper and set it on Mama’s chair. Alright, I’ll be back soon, Sakutaro. After a morning like this, I’ll be happy all day long at school. School is fun too, and everyone in the rabbit band is always happy as well. They really make a ruckus in my pocket. So I’m sure that Mama will make lots of progress in work. So I’m sure that Mama will come home in a good mood. So I’m sure that we will always, always be happy…every day. I could hear a monotonous electronic sound buzzing, buzzing. It was the sound of my alarm clock. ……That’s right. ……I was dreaming the whole time. A small piece of bamboo with that piece of paper hanging from it was beside my pillow. I wonder if that’s why I had such a strange dream. ……Beatrice came from Rokkenjima, ……and clearly drew for me a world that I couldn’t see at all before, at the time I wrote that wish down. …A world where my desire for nothing more than that Mama would come home every day was expanded more and more, into infinity. No, that’s not all. Until a second ago, I really was inside that world. She had endlessly expanded my conservative and unambitious wish. After all, Beatrice is the Endless Witch. ……And, if the world she showed me was made by magic, ……then as a witch apprentice, I should be able to do it too. That happy dream, which was so faint that the alarm had drawn me away from it, I should be able to make into something real. As a witch apprentice, Maria knew how to make that magic a reality. Yes. By believing in magic, it gains power. So Maria strongly believed that it had not been a dream, but something that could be made into reality. ……What was the first thing I did on that happy morning? That’s right. First, I’ll wake Mama up. I’ll bring her some vegetable juice in a chilled cup. Maria jumped out of bed and headed for the kitchen. She wanted to let her mother know that this was the start of a happy morning, which would lead to a happy day and a happy tomorrow. Lambdadelta, who had been chuckling at how sweet the story had been, looked annoyed at this wet blanket response. Beatrice commented that Bern didn’t understand. Beato and Lambda kept lamenting how much Bern didn’t understand. Lambdadelta is the Witch of Certainty. She praises the willpower to certainly succeed until the very end. Despite possessing both innocence and cruelty, she also has a more tender side with regards to people’s passion. Lambda will never smile upon humans who wish to ‘become super-rich’, but do nothing to work towards that goal. Also, she will never grant success to those who try only once to become super-rich. What Lambdadelta bestows is not the fulfillment of the wish, ……but the power needed to achieve it. Those who make their wishes to Lambdadelta must strongly believe that those wishes will be granted eventually. Without that strength of heart, those wishes will not reach Lambdadelta, and never again would power dwell in the Magic of Certainty. And, to those people who certainly never give up, and do not forget the meaning of hard work, it’s merely blasphemy to their hard work to have their wishes granted by another. That’s why Lambdadelta would never dirty their precious hard work. All she promises is to point out the fact that certain resolution will bring forth a future of certainty. And just that is enough for them. And she will definitely grant that wish. No matter what kind of wish. Definitely, some day. With a fed up look on her face, Bern disappeared. In the process of living a thousand years, she had lost her human heart. ……She didn’t like sweet or heart-warming stories. Beato laughed coldly, as though this was the way a witch was supposed to be. ……You’re telling me to grant at least one wish because it’s Tanabata? I am a witch. The witch who governs miracles. ……No matter what kind of effort, fortune, entusiasm, or unity……I know that the end of it all, there is no miracle waiting. Specifically because I know that there will be no miracle, I am the Witch of Miracles. In that case, just whose wish are you saying I should grant……? So what if it’s the Tanabata? They’re just being a little too festive. Expanding a happy dream into infinity? Effort that brings success no matter what…? It’s so sickningly sweet that my tongue will fall off. ……Aah, how revolting. It’s the same to you, right? I will show you a true, witch-like, granting of a wish. Because you’re obviously looking forward to that. A small Ange recieved a small piece of paper at school……wrote “I wish for my family to come home” on it, hung it on a bamboo branch, and fastened that to her bed post. Having wished with all her might, Bern appeared to her in the land next to illusions, the world of slumber. Ange was not able to hide her surprise at this witch, who showed up in the world of her dreams, claiming that she would grant her wish. However, she felt that the witch wanted something in exchange for the miracle. ……But, if her family would come home, Ange thought that she would accept any undertaking. Although, that could be 1 year from now, 5 years from now, or perhaps 10 or more years from now. Eva……had said that to Ange today. We are connected because we are aunt and niece. But, we are also connected in that I have lost a child, and you have lost your parents. And we cannot trick ourselves into thinking of each other as replacements for our lost family. Even so, I think of you as my own child. So if you……could allow that, then I’d like you to think of me as your mother, and I want you to rely on me for whatever you need. Eva had hugged Ange as she said that. To the young Ange, Mom was Mom, and Eva definitely wasn’t. ……However, she understood the the meaning of those words, and the affection verging on sorrow. To the young Ange, that seemed very logical. Right now, we cannot forget the scars on our hearts, and together we have forgotten how to smile. However, I believe that this would surely sadden my child and your parents. ……Wouldn’t it be alright if we could remember how to smile, if only a little bit at a time? Of course, we can’t do this right away. We have to remember our forgotten smiles bit by bit. That’s why…..I’ve decided that from today on, I’ll try my best to practice smiling. Ange-chan, if you ever remember how to smile……..please show me too. I feel that if we do that, we’ll be able to remember how to smile even more. Ushiromiya Ange clearly announced it to Eva. They were, ……the magic words that would bring forth the miracle of her family coming home. And, the words were a curse that the cruel witch had made her say. These kinds of kakera exist, ……but what do you think? All of you who love this kind of ill-natured story…like this level of pain more, don’t you? Is this good enough? Beato? All I really did was make it a tale more suited to my role.